Had to do some email today away from my computer. Although this combo seems perfect with fast wireless internet, a bluetooth wireless keyboard and email client it has one problem…me. I type too fast for the bluetooth keyboard to keep up so it drops letters and has some other glitches. If you’re thinking about getting one of these Palm keyboards I’d have to give it a thumbs-down, not ready for prime time yet. It's still a cool set-up. Yeah, I have yet to find a good keyboard for this smartphone. I have a full on word processor on it that has a spell-checker and thesaurus along with email, web, instant messaging, etc. So it does make a very nice, compact computer that can go online anywhere there's a cellphone signal. 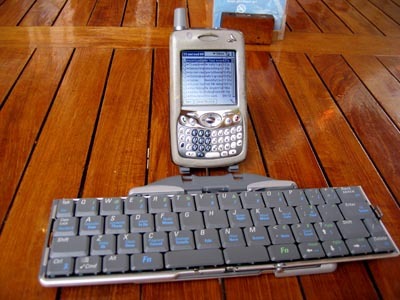 Best keyboard I had for my Palm unit was a Targus keyboard but I don't think they have one for the Treo 650. I don't know anything about your microworkstation, but I do recognize the table. Looks like the food court by Jamba Juice.